This recipe represents the proverbial straw that broke the camels’ back. A few years back, a so called friend asked me to email a company about someone else cheating in a competition they were hosting. She asked me because she didn’t want to damage her relationship with her sponsor. But I didn’t for one minute consider my relationship with them. It’s a repeating pattern in my life where I put my friends’ needs and wants before what is good for me. Last year, someone in the social media business who I thought was my friend, sent me a message asking me to please create a recipe and post it to her client’s page to get the ball rolling for a competition. 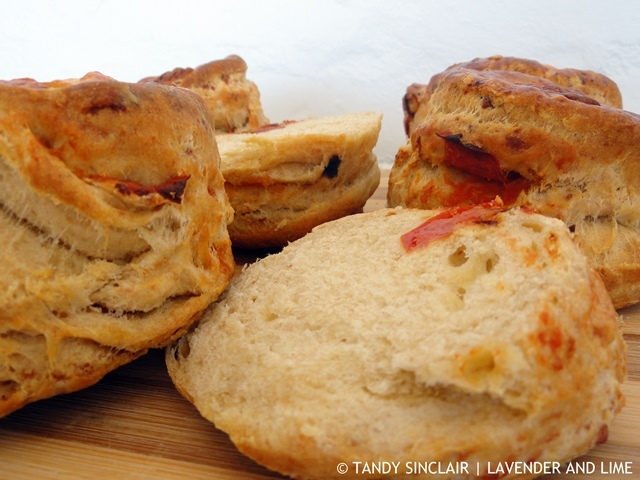 I really didn’t mind and so I made these cheese and tomato scones, with International Scone Week in mind. I did not follow the competition and regretted helping, as a whole lot of bloggers were sent product in a drop off to encourage them to enter and they didn’t bother. I didn’t get the drop off and so used my own money to help her client. And for no reward! I decided there and then that I would have to toughen up and learn to say no to people who don’t have my best interests at heart. You won’t say no to these amazing scones which worked our perfectly for lunch time meals at work for Dave and I. Too bad none of it is in American measurements. I won’t be back. Your choice. I’m South African and work in measurements that suit me. We are writing new menus at my work, totally adding these to the morning/afternoon tea catering package. Delicious! I could so go for one of your scones right now Tandy with my tea! Cheese and tomato is always a winner! Hi Tandy, I love savory scones, what a wonderful combination. Working on a scone recipe for ISW. Will link back…..
I’ve never been a huge bread person, but I’ve always wondered how scones taste. Believe it or not, I’ve never had any. I must try one, one day. Thanks for posting this recipe. I am so sorry you were taken advantage of like that Tandy! I agree – sometimes, “no” is okay – but (you are right again) I would never say no to these brilliant scones! Love the tomato and cheese combo in these! So sorry to hear of your experience,… Sometimes people don’t deserve your friendship…. Mmmm…Tandy, they look so soft and tasty with the cheesy tomato in them! 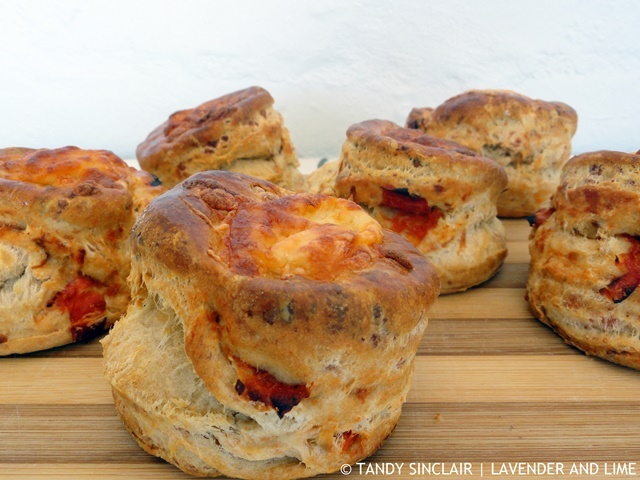 Tandy, I’m sorry about your story but those scones are just gorgeous! These look like they rose beautifully! The cheese and tomato combination is fantastic. Sorry to hear about your bad experience but at least we all get a good recipe from you out of it. Wow, these look great. I will be trying them for sure. It won’t be long before we will have lots of tomatoes ready for picking. These look lovely – I made some scones last night so will post them this week – love international scone week to make me have fund thinking about scone ideas – are we just to leave a comment on your international scone week post? So sorry to hear of your experience, Tandy. People like that don’t deserve your friendship. The scones look amazing!! I’m usually more of a sweet scone person, but these look so flavorful and delicious! Isn’t working with people such a joy? (Not!) The older I get, the more intolerable I grow with the shenanigans of others. I’m a believer in karma. What goes around comes around and only good things will come to you and your honesty. Oh damn I missed International Scone week again! I really love scones and wanted to make something for it as I had some delicious scones on a plane no less! You always amaze me with how unethical people are. But really, I shouldn’t be this naive. I receive so many emails from people claiming wanting to help me and my blog, but in reality, reading in between the lines, they are only looking out for their own interests as I can’t see how their “offer” is at all helpful. These scones look like the single most delicious recipe you have ever posted…..and you have so many scrumptious recipes! I can’t wait to try these. These scones look so delicious Tandy! You got a great rise on these and I love that they are stuffed with cheese! so good.